Accessories: Accompanied by an Orologeria Eberhard Milano presentation box and an Extract from the Archives confirming invoice of the present watch on July 11, 1936 to Italy. The beauty, state of preservation and rarity of the present oversized Longines A7 chronograph in stainless steel cannot be underlined enough. 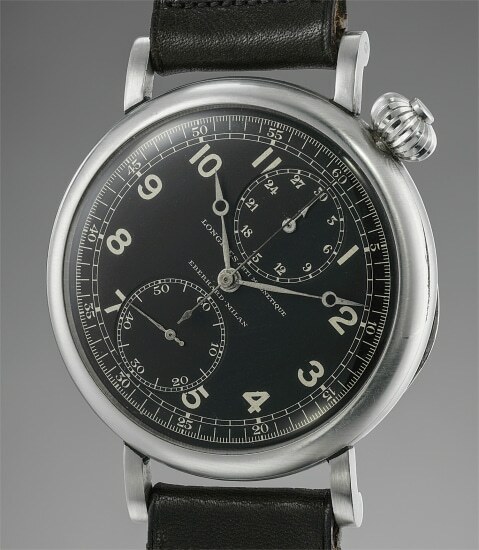 Launched before World War II, these single pusher chronographs were initially produced for aviators with the dial set at an angle so the time could be read easily while piloting. A single button pusher incorporated into the crown allowed the pilot to easily start, stop and reset the chronograph to zero. The Longines A-7 “Avigation” name comes from the US Army Air Corps “Type A” designations for many of their issued equipment watches and derives from the conjunction of “Aerial Navigation”. After the war and for a very short period of time, a small production in stainless steel was produced for the civilian market, as opposed to the chrome-plated military version. The present stainless steel civilian A7 is presented in untouched and original condition. The case is unmolested and the gilt finished movement is superbly preserved. The black matt dial, printed with silver inscription proudly displays the prestigious, Milan-based retailer Eberhard’s signature making it the only known model A7 in steel with retailer signature. The watch is further completed by its original box signed Orologeria Eberhard Milano. The present watch is not only an ultra-rare example in stainless steel but its new old stock condition, original strap and buckle, retailer signed dial and original box is sure to delight any connoisseur of large and unusual timepieces.